They say the best things come to those who wait. 10 long years after the Star Wars prequel trilogy wrapped up with Star Wars: Episode III - Revenge of the Sith, and three years after Disney first announced their purchase of LucasFilm, Star Wars: The Force Awakens finally hit theaters this weekend, and it's taking the world by storm. We reported on Friday that Star Wars: The Force Awakens is on track to be the biggest movie of all time, and today's box office numbers revealed this blockbuster shattered Jurassic World's opening weekend record with $238 million. As beloved as this blockbuster has become, it still didn't provide fans with all the answers they were looking for. Be warned, if you haven't seen Star Wars: The Force Awakens yet, there will be MASSIVE SPOILERS BELOW, so be sure to read on at your own risk. 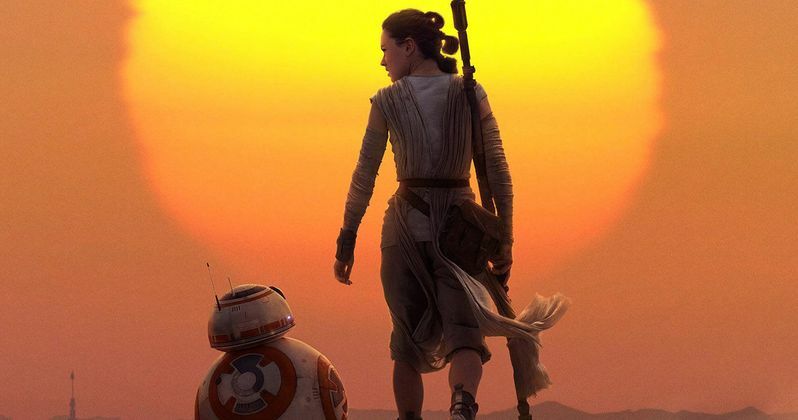 Right from the start, Star Wars: The Force Awakens was shrouded in secrecy, which spawned rumor after rumor from insiders and outsiders alike, all with new details on the casting, characters and the production, once principal photography got under way last year. Some of those rumors were proven to be true, such as the death of Han Solo, while others were proven false, such as the opening of the film featuring a lightsaber that falls from the sky and lands on the desert planet of Jakku. Now that Star Wars: The Force Awakens is finally here for all to see, we're breaking down the biggest unanswered questions from director J.J. Abrams' immense sci-fi adventure, set in that beloved galaxy far, far away, filled with colorful characters, villainy and intrigue. As you well know by now, Star Wars: The Force Awakens is just the beginning. This blockbuster will be followed by the first spinoff, Rogue One: A Star Wars Story, which is currently in production and set to hit theaters on December 16, 2016. Director Rian Johnson's Star Wars: Episode VIII is slated for release on May 26, 2017, with Star Wars Anthology: Han Solo Movie arriving on May 25, 2018 and Star Wars: Episode IX premiering sometime in 2019. Lucasfilm is also developing a Third Star Wars Spin-Off Movie, which is presumably set to arrive in 2020. Keep in mind, the aforementioned projects above are merely the ones that have been announced so far. Last month, a report surfaced that revealed Disney plans on putting out a new Star Wars movie every year, indefinitely, until the demand for these bold adventures dries up with moviegoers. As of now, Disney and LucasFilm haven't announced any formal plans for either movie or TV projects, but don't be surprised if we hear about even more projects in the new year, perhaps even an update or two on the Third Star Wars Spin-Off Movie. Josh Trank was initially set to direct, before he left the project earlier this year, and LucasFilm hasn't announced his replacement yet. But still, what does the seemingly infinite potential of the burgeoning Star Wars have to do with these unanswered questions? Quite a bit, actually. It would be one thing if the studio was planning a trilogy and three spinoffs, and that's it, but we know that's not the case. This means it's possible some of these questions we're seeking answers for may not be resolved in Star Wars: Episode VIII, or even Star Wars: Episode IX. With that in mind, we present 15 unanswered questions from Star Wars: The Force Awakens, and when we might find some answers to these burning questions. This is your absolute last warning for SPOILERS, so if you haven't seen Star Wars: The Force Awakens yet, or if you aren't averse to spoilers, then turn away now and come back after you've seen this epic blockbuster. We begin with with one of the new heroes introduced in Star Wars: The Force Awakens, whose journey will be followed very closely from here on out. 1 Who is Rey? Skywalker? Solo? Kenobi? With just just one movie credit and a handful of TV guest spots to her name, British actress Daisy Ridley was plucked from obscurity by director J.J. Abrams, when he cast her as Rey in Star Wars: The Force Awakens. If you think about it, Daisy Ridley's journey somewhat mirrors that of her character, and while there is a lot we found out about Rey in Star Wars: The Force Awakens, her presence raises even more questions. We know Rey grew up on her own after her family abandoned her on the desert planet of Jakku. Director J.J. Abrams has confirmed that Rey's surname has been kept secret for a reason, hinting that she could be the offspring of either Han Solo and Leia, or Luke Skywalker himself. It's also possible that she could be related, in some way, to Obi-Wan Kenobi. The exclusion of Rey and Finn's surnames in Star Wars: The Force Awakens has lead to much speculation, with many believing that they are related, in some ways, to original trilogy characters such as Luke Skywalker. However, there is another iconic character that Rey could be related to: Obi-Wan Kenobi. Director J.J. Abrams confirmed over the weekend that Ewan McGregor and the late Alec Guinness' voice was used for different versions of Obi-Wan Kenobi in a scene where Rey experiences visions after touching Luke Skywalker's lightsaber. This scene also features Frank Oz voicing Yoda, but Obi-Wan Kenobi's inclusion could hint that Rey is somehow related to the late Jedi master. Rey's parentage was a major part of the story, since she didn't want to leave Jakku in case her parents ever came back for her. Of course, Obi-Wan Kenobi dies at the end of Star Wars: Episode IV - A New Hope, but he appears to Luke Skywalker in the form of a Force Ghost throughout the rest of the original trilogy. While we learned much more about this iconic Jedi in the prequel trilogy, there is never any indication that he bore any children. However, there is roughly a 20-year gap between Star Wars: Episode III - Revenge of the Sith and Star Wars: Episode IV - A New Hope, so it's possible that he could have had a child, and that child may have given birth to Rey, which would help explain why Rey is so Force-strong. We don't have any facts to back this up yet, but it's an interesting theory to ponder moving forward. It's also possible that Rey could have been another child of Han Solo and Leia Organa, which would also explain why she's so powerful with The Force. This would also make Rey the sister of Ben Solo, a.k.a. Kylo Ren, which makes their battle at the end of Star Wars: The Force Awakens even more intriguing. It would also continue a theme of secret siblings established in the original trilogy, and could provide for one of Star Wars: Episode VIII's most jaw-dropping moments, much like Darth Vader's reveal of Luke Skywalker being his son in Star Wars: Episode V - The Empire Strikes Back. There are hints of a kinship of sorts between Han Solo and Rey in Star Wars: The Force Awakens, but it's never explicitly said that Han is Rey's father. Then again, this could give her even more motivation to fight her possible brother in the sequel, if she does learn that Han Solo is her father. Rey is also the only character to interact with Luke Skywalker, at the very end of Star Wars: The Force Awakens, although no words were spoken between them. There is so little we know about Luke's journey in Star Wars: Episode VI - Return of the Jedi, so it's certainly possible that the legendary Jedi could have fathered Rey as well. There are a lot of tidbits throughout the movie that point this direction from the abandonment on a desert planet, to the tech-savviness, to the Rey's strength with The Force. Is it that easy though? Hopefully we find out soon. It's noteworthy to keep in mind that producer Kathleen Kennedy recently confirmed that this trilogy will focus on the Skywalker family saga, and since Rey's family is such a big mystery, Luke may very well be her father.